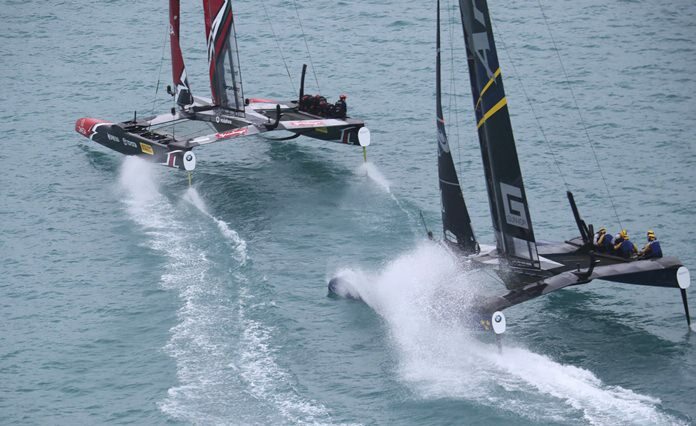 San Diego (AP) — Fast, foiling catamarans are out of the America’s Cup and monohulls are back in. America’s Cup champion Emirates Team New Zealand confirmed Monday that it is working on designs for a “high-performance” single-hulled boat to be used in the 36th edition of sailing’s marquee regatta in Auckland in early 2021. The Kiwis did not say whether the boats will have foils or canting keels. More details were promised at the end of the month. Team New Zealand released a statement after Italian billionaire Patrizio Bertelli, boss of the Italian Challenger of Record Luna Rossa and CEO of Prada, told La Stampa that the next regatta will be sailed in monohulls as a condition of his group helping the cash-strapped Kiwis in the 35th America’s Cup. Foiling is all the rage in sailing. It made its America’s Cup debut on San Francisco Bay in 2013, when the Kiwis blew an 8-1 lead to Oracle Team USA in a showdown of 72-foot catamarans. The boats were reduced to 50 feet for the 2017 America’s Cup. Team New Zealand hit on a remarkable design package and wrested the oldest trophy in international sports from the American-backed team in June on Bermuda’s Great Sound. When the cats hit a certain speed, they’d rise up on foils on the leeward daggerboard and both rudders, lifting the hulls completely out of the water to reduce drag and increase speed. In Bermuda, they hit speeds approaching 50 mph. In a few races, crews made it all the way around the course without the hulls touching down. While the catamarans aided Cup organizers’ quest to make it a more TV-friendly sport, there was grumbling from traditionalists that the competition was a drag race that eliminated most match-racing tactics. There also were complaints that only a few crewmen actually sailed the boats while the majority of the crew turned the winches that powered the hydraulic systems used to trim the wingsails and raise and lower the daggerboards. Crews were reduced from 11 in 2013 to six this year. There was the thought that returning to monohulls would be a step backward, especially since the Kiwis have the world’s best apparent wind sailor, helmsman Peter Burling, and had hit on innovative design elements that would have given them a strong advantage in the next regatta. But the return to monohulls could increase the number of challengers. Some had stepped away because of disagreements over the boats and other rules, and because tech billionaire Larry Ellison, owner of Oracle Team USA, had such a strong grip on the event. With Oracle no longer holding the trophy, it’s expected that multiple American syndicates will emerge, as well as former America’s Cup mainstays like Australia. It’s unclear whether Ellison will continue on. He helped back teams from Japan and France in the 2017 regatta. Two of Team New Zealand’s brightest stars, Burling and wing trimmer Blair Tuke, will sail in the Volvo Ocean Race beginning Oct. 22. The round-the-world classic will be sailed in 65-foot monohulls. The VOR will shift to foil-assisted boats for the 2019-20 race. The last time monohulls were used in the America’s Cup was 2007. They were plodding compared to the catamarans. In 2010, after a bitter court case between Ellison and Swiss billionaire Ernesto Bertarelli led to a one-off showdown, Oracle Team USA sailed a massive trimaran to victory over Alinghi’s equally huge catamaran. Ellison and his top sailing lieutenant, Russell Coutts, then forged on with their vision to contest the Cup in catamarans. He also said there will be some form of a nationality rule. After an Australian syndicate dropped out as Challenger of Record for the 35th America’s Cup, most of the remaining challengers agreed to an unprecedented midcourse downsize in the boats. Luna Rossa angrily withdrew. Team New Zealand also was angry about the change, but stayed in and received manpower and badly needed cash from the Italians.